Lentils like other beans are legumes but compared to other types of dried beans, lentils are relatively quick and easy to prepare. 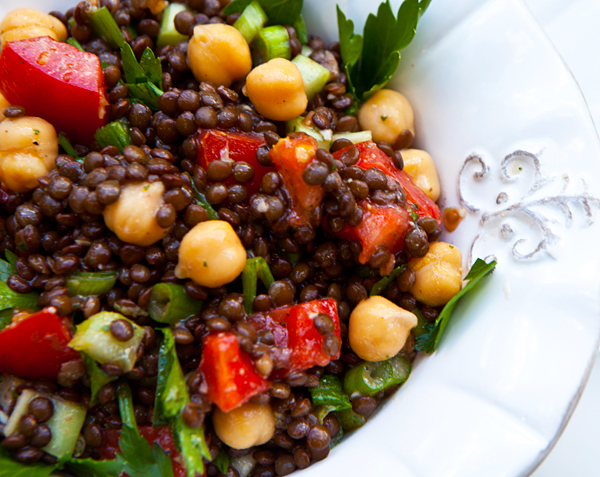 Lentils are great in salads as they readily absorb a variety of wonderful flavors from other foods and seasonings, are high in nutritional value, inexpensive, and are available throughout the year. I recently came across black lentils, often called beluga lentils as they resemble caviar and thought they would be delicious as well as pretty in a lentil salad. We love salads like this as I can make a big batch and keep it in the refrigerator to enjoy for lunches at home, pack in coolers to take with us to the beach, or enjoy as a side dish with grilled chicken or seafood for dinner. You can play around with the ingredients as you choose, just use your imagination and try to keep the ingredients complementary in flavor. I like to balance my salad ingredients to add color and a diversity of textures, but I often change the ingredients as my mood changes, or depending on what I have on hand in my refrigerator. If black lentils are not available, choose the small green or beige lentils as they remain firm when cooked. I’d suggest avoiding the large red lentils which I find can easily get mushy when cooked. 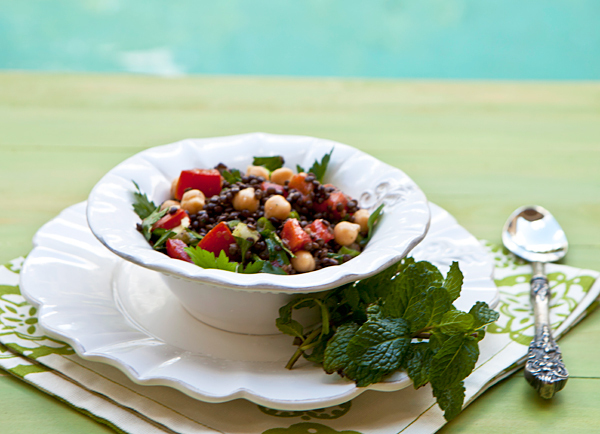 A healthy combination of fresh vegetables, black lentils, and chickpeas create a delicious hearty salad. Cook the lentils until "al dente" in boiling water, about 20 minutes. Drain lentils and bring to room temperature. Use a blender or hand wand to puree the dressing ingredients. Add the lentils and other ingredients into a large bowl, then pour on the dressing and toss to mix.